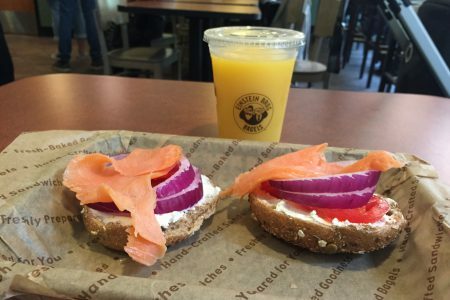 Here I am having breakfast at 9 am at Einstein Bros in one of the best metropolitan cities in America that I know. It got the greatness of New York, but it is more relaxed, more quiet and its location at the shore of Lake Michigan ensures a steady supply of fresh air. Yes, I am talking about Chicago, but you already know that I am here, because you have read yesterday’s blog post! It’s been a typical “cargo day”. I got up in the morning, showered and was just about to leave to for breakfast and shopping in order to make it back at midday to get ready for my flight, when I got a message. “Mr Gottwald, your flight is being delayed“. I don’t know what the reason was, but what concerned me was my schedule! Initially we were supposed to leave in the early afternoon to land in Mexico City before sunset – just in time to take a nice video sequence of our landing at get something to eat near the hotel once we get there. After getting the delay message it initially looked like we might be flying dead-head (again!) to MEX and I wasn’t sure about the times and what I would be able to do still then. After an hour I was informed that we would be delayed till the evening, when our aircraft would be coming in from Frankfurt. However, I was already out on the street wanting to do shopping! It was 10 am, but none of the shops would open! Even 10 minutes later there was no chance of getting in anywhere. That was when I thought it might be a good idea to ask someone what the time was – only 9.10 am… Seems I was getting a bit confused with all the time zones in Germany, UTC, local times in the US. It wasn’t the first time that happened to me. That is why I am sitting in a bagel bar waiting for time to pass. Luckily it is a great day in Chicago again and walking along the streets is simply great. I am taking a stroll down Michigan Avenue until I reach the North Avenue Beach. The last time I was here was for the Chicago Air and Water Show two years ago, when I was sitting in the sun with aircraft performing aerobatics right in front me. Found this at Best Buy and did some drone simulator flying in the store! On the way back I stop by all the shops I wanted to go to, but I am unlucky as they don’t have anything that I like or that fits. But that often happens, especially with pants and shirts. On the way back to the hotel I stopped by at the legendary Billy Goat Tavern & Grill which is underground below Michigan Ave (reminds me of Atlanta Underground again). The Double Cheezborger is what you want to go for! The rest of the day was uneventful. I watched TV and videos online, did some work on my website, downloaded photos and videos from my camera, went to the supermarket to get something for dinner, wrote emails, watched stuff on the internet again – simply some regular boring things. We met in the evening while everybody was coming in from dinner and people were having a great time. Luckily we were at the airport early. As we use private property on the South Cargo ramp for our operations, we didn’t have to go through the terminal and avoided the crowds there. Briefing took place in a room in our warehouse and from there it is only a short walk to the aircraft. Our MD-11s park really close to the warehouse in Chicago! The aircraft involved in today’s flight was D-ALCA, the oldest MD-11F currently in active service with Lufthansa Cargo. It first flew in March 1998 and was delivered to the airline in June the same year, together with its sistership D-ALCB. We met with the crew that arrived from Frankfurt and then quickly prepared everything for departure again to leave asap. We went off-blocks an hour earlier than planned! After departure from runway 32L we followed the standard O’Hare 8 departure route, which is basically runway heading to 5000 feet. We were advised by ATC to do a long right turn on heading 180 after passing 3000 feet, which gave us a great view on the city and took us right over the airport again. After that we got a direct heading towards the PSX VOR (Palacios in Texas). On the way we encountered a weather front, but with the help of ATC and our on board weather radar we were able to circumnavigate the worst parts. However, for about 40 minutes we had a wonderful presentation of St. Elmo’s fire – infrequent but more or less steady. St. Elmo’s fire as seen from the cockpit! Our arrival to Mexico City was surprisingly easy. With runway 23R in use and 23L closed, we had to do a VOR approach, which was nicely executed by the captain. Some showers had gone over the airport shortly before and the runway was wet – that meant our required landing distance was only about 150 m less than the available runway length. We therefore selected Auto Brake Medium (we never use High), Flaps 50 and had to apply maximum reverse thrust. Although we want to reduce the noise impact to people living near the airport as much as possible, we didn’t have a choice here and had to use the most noisy flap and reverse thrust settings. We left the runway at the last exit and taxied back on taxiway Bravo and later Charlie to our parking spot 44. Unfortunately the photos shot during approach didn’t come out too well due to heavy vibration of the aircraft and my camera mount – if someone has a good solution at hand on how to mount a DLSR in a cockpit, please let me know! View from my hotel room in Mexico City. The timezones in the US confused you, isn’t it? Great updates! Great post man!! It just wonderful to have the opportunity to follow you on this trip, keep it going!! Leave a Reply to Jamill Aviation Click here to cancel reply.